We are under impression that this class is being purchases by students for personal use only and we are providing this classes/product for the same purpose. Reproducing lectures or books or any material provided in any format, attempt to breach the security, attempt to copy the lecture or share with any party/unauthorized party(authorization will be decided on the basis approval from way to pinnacle institute private limited), copying and delivering lectures etc will attract strict legal proceedings under Indian laws to it's full extent. 100% coverage as per ICAI syllabus and material, fully updated as per new course, high quality, Full HD lectures which will run on Laptop only. 2 views will be given to student. For example for a lecture of 2 hours student will get 4 hours view. However a student may view a lecture multiple time, total time will be counted. Time or views extension won't be done. Lectures/product will be valid for 6 months from day of activation, all amendments in between will be provided free of cost. Classes can't be displayed using projector or any external display. Test schedule will be shared after booking pen drive, for online tests modules only one id and password will be issued against particular booking. Student needs to provide a photo id proof, ICAI registration letter, A self-declaration video(sample is available on website), through e-mail or whatsapp to mentioned e-mail id and whatsapp number only. (For email id and whatsapp number, Photo ids and link to sample self-declaration videos link see below). Documentation is essential pre-requisite for dispatch of package. No exception will be made in this context. For system requirement click the system requirement tab at the time of enrolment, also go through product description and features or see below for link. To use the product first time student needs to have internet connection for activation, we also get your system details (at hardware level) and students are advised to use this product for personal use only. 1. Type of Content on the Site The information available on this Site, including, without limitation, reviews, opinions, directions, guides, graphics, photographs, logos, audio or video clips, Submissions and data (collectively "Content") is not a substitute for any type of professional advice, including, without limitation, psychiatric, medical, financial, or legal advice. Always seek the advice of an appropriate professional and never disregard professional advice or delay in seeking it because of Content on this Site. Way to pinnacle does not certify or endorse the Content on this Site, including without limitation any opinion, recommendation, advice, or any other information contained in the Content. waytopinnacle.com IS NOT RESPONSIBLE FOR HARM TO PERSONS OR PROPERTY THAT RESULTS FROM YOUR USE OF THE SITE, INCLUDING WITHOUT LIMITATION, USE OF ANY CONTENT ON THE SITE. 2. Agreement to Deal Electronically Your use of the Site is conducted electronically and you agree that waytopinnacle.com may communicate with you electronically for all aspects of your use of the Site, including sending you electronic notices. If you do not wish to deal electronically, do not use this Site. Delivery of electronic notices is not infallible, so you agree to contact waytopinnacle.com if you need information about the Site. You agree to keep all records relating to your use of the Site and to print or make an electronic copy of this Agreement and any disclosures provided on the Site. You agree that in case there are any changes in your information provided by you to us, including your e-mail address and other contact details, you will be solely responsible to update them regularly. Except as prohibited by law, you waive any law requiring different communication methods in connection with your use of this Site.waytopinnacle.com reserves the right, at its sole discretion, to deliver notices and disclosures by other means such as postal mail. You agree that all notices, disclosures and other communications that we provide to you electronically satisfy any legal requirement that such communications be in writing. 3. Changes to this Agreement The Site is like a store: every time a customer enters a store the customer is bound by the Terms in effect on the date of the customer's visit. Similarly, at this Site, you are bound by the version of this Agreement that is in effect on the date of your visit. The terms of this Agreement may change from time to time so please review it when you visit the Site. Any use of the Site after the effective date of any change will constitute your consent to the revised Agreement. 4. Protect Your Password: Account and Password When you register with us, an account will be created for your use ("Account") on the Site and you will be provided with required Account Information to enable your access to the Account. The term "Account Information" refers to a user identification code, password or any other piece of information which may be provided to you as part of our security procedures. If you access the Site after logging into any third party app like Facebook, Twitter or Gmail, the login information of such third party account, as the case may be, shall be considered as the Account Information. You must always treat Account Information as confidential and must not disclose it to any third party. Any access to the Site through your Account shall be considered an access by you or on your behalf and you shall be solely responsible for any activity carried out in, by or through your Account either on the Site or any other Site accessed by you through the Site. Subject to applicable law, you agree to be liable for all uses of your Account whether or not actually authorized by you, including but not limited to uses of your Account to submit questions at the Site or to answer questions through the Site. If you know or suspect that anyone other than you knows or has unauthorized access to your Account Information or any part of it, you must promptly notify us by sending us an e-mail at CONTACT DETAILS. If we change the eligibility criteria to be registered with the Site and you no longer comply with the new eligibility criteria, as determined by us in our sole discretion, you accept that we may close your Account without any liability for us. You are solely responsible for ensuring that these Terms are in compliance with all laws, rules and regulations applicable to you and the right to access the services is revoked where these Terms or use of the services is prohibited under the applicable law and, in such circumstances, you agree not to use or access the Site or services in any way. We have the right to disable your use of the Account Information or any part of it, whether chosen by you or allocated by us, at any time, if in our reasonable opinion you have failed to comply with any of the provisions of these Terms. 6. Intellectual Property Rights We are the owner of the Site. However, the ownership of the Content is with the creator of that specific Content. The Company may have ownership rights on the Content available on the Site. We are the licensee of all copyrights, trademarks, service marks or any other intellectual property in the Content published on the Site. All such rights are reserved. You must not modify the paper or digital copies of any materials you have printed off or downloaded in any way, and you must not use any illustrations, photographs, video or audio sequences or any graphics separately from any accompanying text. You must not use any part of the Content on the Site for commercial purposes without obtaining a licence to do so from us or our licensors. If you print off, copy or download any part of the Site in breach of these Terms, your right to use the Site will cease immediately and you must, at our option, return or destroy any copies of the materials you have made. waytopinnacle.com hereby grants you a limited, non-transferable license to access and use the Site and Content solely for your personal, non-commercial purposes. Except for the license in this Section 6, waytopinnacle.com retains all right, title, and interest in and to the Site and Content. Subject to applicable law, waytopinnacle.com reserves the right to suspend or deny, at its sole discretion, your access to all or any portion of the Site with or without notice. You may not access or use the Site or any portion of the Site if such access would violate any law. Except as provided in this Agreement, permission to reprint or electronically reproduce any Content in whole or in part for any purpose is expressly prohibited, unless prior written consent is obtained from waytopinnacle.com. You may contact us if you wish to obtain such consent. The Content on this Site is protected by copyright under both Indian and foreign laws. All rights not expressly granted herein are reserved to waytopinnacle.com and its licensors. The license in this Section 6 does not include permission to copy the design elements, "look and feel" or layout of this Site. Those elements are protected by law, such as trade dress, trademark, unfair competition, and other laws, and may not be copied or imitated in any manner. Subject to applicable law, waytopinnacle.com reserves the right to revoke the above permission at any time and to suspend or deny, in its sole discretion, your access to all or any portion of the Site with or without notice. Except as expressly provided in this Agreement, neither waytopinnacle.com nor any third party has conferred upon you by implication, estoppels, or otherwise, any license or right under any patent, copyright, trademark, trade secret or any other proprietary right. 7. Terms Relating Services If you use the services , you are solely responsible for communications posted by you or through your Account. You agree that violation of any of the following Terms constitutes a material breach of this Agreement: Using the service for any purpose in violation of local, state, national, or international laws; Providing false information on your registration form or impersonating any person; Posting material that infringes on the intellectual property rights of others or on the privacy or publicity rights of others; Posting or transmitting any information, data, text, files, links, software, chat, communication, or any other materials that are unlawful, harmful, threatening, abusive, invasive of another's privacy, harassing, defamatory, slanderous, vulgar, obscene, hateful, racist, embarrassing or otherwise objectionable to any other person or entity as determined by waytopinnacle.com in its sole discretion, or contains content that would be prohibited or violates the letter or spirit of the Terms; Posting or transmitting any unsanctioned advertising, promotional materials, or any other forms of unsanctioned solicitation, including, without limitation, "junk mail," "Spam," "chain letters," or any unsolicited mass distribution of email; Posting surveys, contests, or pyramid schemes; Posting improper questions or answers that are not related to the particular topic; Stalking, harassing, or otherwise harming others; Distributing viruses, corrupted files, or any other similar software or programs that may damage the operation of another's computer; Collecting or storing personal data about other users of the Site; Inducing, enticing, soliciting, recruiting, luring, or attempting to induce, entice, solicit, recruit, or lure users or experts to another web site which, in waytopinnacle.com reasonable determination, is a competitor of waytopinnacle.com; Engaging in any other conduct that inhibits any other person from using or enjoying the Q&A service or the Site; Accessing or attempting to access any restricted portions of the Site including any developer code not freely available; Breach of any legal duty owed to a third party, such as a contractual duty or a duty of confidence; Threatening the unity, integrity, defence, security, foreign relations or sovereignty of India. Engaging in any other behaviour on the Site, which in waytopinnacle.com sole discretion is unacceptable. waytopinnacle.com may (but is not obligated) to remove Content for any reason, with or without notice to you, including without limitation Submissions (as defined below) that do not conform with the Terms and terminate your access to the Site. 8. License to Submissions to the Site Should you provide this Site with information to be available to other users of the Site, including without limitation, postings, feedback, data, questions, comments or suggestions ("Submissions") those Submissions will be deemed non confidential and to be your property and you undertake that you have the requisite permissions to share such Submissions. In consideration of the services provided to you by us,you grant waytopinnacle.com a royalty-free, perpetual, irrevocable, world-wide license to use, copy, reproduce, create derivative works from, adapt, modify, publish, edit, translate, sell, distribute, transmit, transfer, publicly display, publicly perform, and display the Submissions without any limitation and in any media or any form now known or later developed. Such additional uses by us or others may be made with no further consideration paid to you. waytopinnacle.com may sublicense these rights to third parties. 9. Copyright Infringement Notification & Other Reports waytopinnacle.com relies on users of the Site to bring copyright violations to our attention. If you are aware of infringing materials on the Site, please notify waytopinnacle. To be effective, the Notification must include the following: A physical or electronic signature of a person authorized to act on behalf of the owner of an exclusive right that is allegedly infringed; Identification of the copyrighted work claimed to have been infringed, or if multiple copyrighted works at a single online site are covered by a single notification, a representative list of such works at that site; Identification of the material that is claimed to be infringing or to be the subject of infringing activity and that is to be removed or access to which is to be disabled, and information reasonably sufficient to permit waytopinnacle.com to locate the material; Information reasonably sufficient to permit waytopinnacle.com to contact you, such as an address, telephone number, and if available, an electronic mail address at which you may be contacted; A statement that you have a good faith belief that use of the material in the manner complained about is not authorized by the copyright owner, its agent, or the law; and A statement that the information in the notification is accurate, and under penalty of perjury, that you are authorized to act on behalf of the owner of an exclusive right that is allegedly infringed. Notwithstanding the foregoing, waytopinnacle.com does not guarantee any action based upon the receipt of such information. ALL INQUIRIES NOT IN COMPLIANCE WITH THE ABOVE NOTICE AND PROCEDURE FOR MAKING CLAIMS OF COPYRIGHT INFRINGEMENT WILL RECEIVE NO RESPONSE. 10. Your Representations & Warranties You represent and warrant for the benefit of waytopinnacle.com and waytopinnacle.com.com licensors, suppliers, and any third parties mentioned on the Site that: (a) you are at least 18 years of age;and if you are below 18, then you have obtained verifiable parental consent to use this site; (b) you possess the legal right and ability to enter into and make the representations and warranties contained in this Agreement; (c) all information that you submit to us is true and accurate; (d) you will keep your registration information accurate at alltimes; (e) you will be responsible for all use of your Account even if such use was conducted without your authority or permission (for example, and not by way of limitation, if an unauthorized third party submits or answers a question under your Account); (f) you will not use the Site for any purpose that is unlawful or prohibited by this Agreement (for example, and not by way of limitation, abiding by the Terms); and (g) all Submissions are owned by you and waytopinnacle.com use of the Submissions does not infringe or violate the intellectual property or other rights of any third parties. 11. Indemnity You agree to defend, indemnify and hold harmless waytopinnacle.com and its members,officers, directors, employees, agents, licensors, and suppliers, from and against all claims, actions or demands, liabilities, and settlements, including, without limitation, reasonable legal and accounting fees, arising in connection with your use of the Site or resulting from, or alleged to result from, your use of the Site or your violation of this Agreement or your violation of the applicable law or the rights (including infringement of intellectual property rights) of a third party. You will cooperate as fully required by the Company in the defense of any claim. The Company reserves the right to assume the exclusive defense and control of any matter subject to indemnification by you, and you will not in any event settle any claim without the prior written consent of the Company. 12. DISCLAIMERS OF ALL WARRANTIES AND DUTIES THIS SITE AND ALL CONTENT IS PROVIDED "AS IS," "AS AVAILABLE," "WITH ALL FAULTS," AND WITHOUT WARRANTY OF ANY KIND. Waytopinnacle.com AND waytopinnacle.com LICENSORS GIVE NO EXPRESS WARRANTIES AND DISCLAIM: (A) ALL IMPLIED WARRANTIES, INCLUDING, BUT NOT LIMITED TO, WARRANTIES OF MERCHANTABILITY; FITNESS FOR A PARTICULAR PURPOSE; waytopinnacle.com OF THE SITE; LACK OF VIRUSES, WORMS, TROJAN HORSES, OR OTHER CODE THAT MANIFESTS CONTAMINATING OR DESTRUCTIVE PROPERTIES; ACCURACY, COMPLETENESS, RELIABILITY, TIMELINESS, CURRENCY, OR USEFULNESS OF ANY CONTENT ON THE SITE; AND (B) ANY DUTIES OF REASONABLE CARE, WORKMANLIKE EFFORT OR LACK OF NEGLIGENCE. THE ENTIRE RISK AS TO SATISFACTORY QUALITY, PERFORMANCE, ACCURACY AND EFFORT IN CONNECTION WITH THE SITE AND CONTENT IS WITH YOU.WE ASSUME NO LIABILITY OR RESPONSIBILITY FOR ANY ERRORS OR OMISSIONS IN CONTENT. IN ADDITION, waytopinnacle.com DISCLAIMS ANY WARRANTIES OF NON-INFRINGEMENT, TITLE, OR QUIET ENJOYMENT. We are not responsible for the Content uploaded by you on the Site. We are not responsible for any direct or indirect damages or losses caused to you, including without limitation, lost profits, business interruption or other loss resulting from use of or reliance in any way on anything available on the Site. It is solely your responsibility to evaluate the accuracy, reliability, completeness and usefulness of Content available on the Site that is used by you. We make no warranty that the services or Site will meet your requirements or that the services or your access to the Site will be uninterrupted, timely, accurate or reliable; nor do we make any warranty as to any information that may be obtained through the services or Site. In case there is any defect in any software being used for the provision of the services, we do not make any warranty that defects in such software will be corrected. You understand and agree that any material and/or data downloaded or otherwise obtained through use of the services or Site is done at your own discretion and risk and you will be solely responsible for any damage to your computer system or loss of data that results from the download of such material or data. The Company disclaims all liability to either the user or any person claiming for any breach of the terms of the Agreement including claims based on the ratings, reviews mentioned on the Site. The Company/Site makes no representations as to the reliability, accuracy of the Content or qualifications of any of the users or the quality, security or legality of any services and the Company disclaims any and all liability relating thereto. The Company/Site does not implicitly or explicitly support or endorse the procurement of any service on the Site. No advice or information, whether oral or written, obtained by you from the services or Site or through the service(s) or Site shall create any warranty not expressly made herein. 13. RELEASE AND WAIVER To the maximum extent permitted by applicable law, you hereby release and waive all claims against the Company, and its subsidiaries, affiliates, officers, agents, licensors, co-branders or other partners, and employees from any and all liability for claims, damages (actual and/or consequential), costs and expenses (including litigation costs and attorneys' fees) of every kind and nature, arising from or in any way related to your use of our Site, its services or Content. You understand that any fact relating to any matter covered by this release may be found to be other than now believed to be true and you accept and assume the risk of such possible differences in fact. In addition, you expressly waive and relinquish any and all rights and benefits which you may have under any other state or central statute or common law principle of similar effect, to the fullest extent permitted by law. If we fail to insist that you perform any of your obligations under these Terms, or if we do not enforce our rights against you, or if we delay in doing so, that will not mean that we have waived our rights against you and will not mean that you do not have to comply with those obligations. If we do waive a default by you, we will only do so in writing, and that will not mean that we will automatically waive any later default by you. 14. Viruses You will be responsible for introduction of any viruses, trojans, worms, logic bombs or other material which is malicious or technologically harmful. You must not attempt to gain unauthorised access to the Site, the server on which the Site is stored or any server, computer or database connected to the Site. You must not attack the Site via a denial-of-service attack or a distributed denial-of service attack. By breaching this provision, you would commit a criminal offence under the Information Technology Act, 2000. We will report any such breach to the relevant law enforcement authorities and we will co-operate with those authorities by disclosing your identity to them. In the event of such a breach, your right to use the Site will cease immediately. You should use your own virus protection software. We cannot and do not guarantee or warrant that files available for downloading from the Site will be free of infection by viruses, worms, Trojan horses or other code that manifest contaminating or destructive properties. 15. Links to Third Party Sites As a convenience, we may provide links to third party web sites from the Site. Waytopinnacle.com is not responsible for and does not endorse the informational content or any products or services available on any third-party web site and does not make any representations regarding their content or accuracy. We do not control any third party web site, and we are not liable for any technological, legal or other consequences that arise out of your visit or transactions there. Your use of third party websites is at your own risk and subject to the terms and conditions of use for such sites. This means that we are not your agent and will not be a party to any contract you enter. 17. Miscellaneous; Entire Agreement If any part of this Agreement is determined to be illegal, void, invalid or unenforceable, then the invalid or unenforceable provision (or portion) will be deemed superseded by valid, enforceable language that most closely matches the intent and allocation of risk in the original provision (or portion) and the rest of the Agreement will continue in full force and effect. The Agreement constitutes the entire agreement between you and waytopinnacle.com with respect to the Site and your use of the Site, and supersedes all other (prior or contemporaneous) communications or displays whether electronic, oral, or written, between you and waytopinnacle.com regarding the Site and your activities. 18. Geographical & Export Restrictions You agree that all Content posted or accessible via the Site is subject to applicable export control laws and regulations of the Indian Government. You agree not to export or re-export any Content directly or indirectly, to any country not permitted by Indian government export restrictions. 19. APPLICABLE LAW &JURISDICTION This Agreement is governed by the law of India, without giving effect to the principles of conflicts of laws thereof. Your consent to this Agreement includes your consent to jurisdiction and venue in the courts in DELHI, in all disputes arising out of or relating to this Agreement. waytopinnacle.com makes no claims that this Site is appropriate for viewing or accessing outside India. You consent to exclusive jurisdiction and venue in the courts of DELHI. You waive all defenses of lack of jurisdiction, venue, or forum non-convenience. Use of the Site is not authorized in any jurisdiction that does not give effect to all provisions of this Agreement. WAYTOPINNACL.COM performance of this Agreement is subject to existing laws and legal process, and you agree that we may comply with law enforcement or regulatory requests or requirements notwithstanding any contrary term of this Agreement. Any cause of action or claim you may bring in connection with the Site, including without limitation any Content, must be commenced within one (1) month after the claim or cause of action arises otherwise such claim or cause of action shall, subject to the applicable law, be deemed to be barred. In any dispute between WAYTOPINNACLE.COM and you relating to this Site, the prevailing party will not be entitled to attorneys' fees, costs and expenses. 20. TERM & TERMINATION We reserve the right to refuse to continue providing you with access to this Site if we discover that you are incompetent to contract by virtue of your age or otherwise under Applicable Law. This Site is not available to persons whose membership has been suspended or terminated by us for any reason whatsoever. The Terms shall continue to form a valid and binding contract between the user and the Company, and shall continue to be in full force and effect until users continue to access and use the Site. Provided, however, certain sections of these Terms such as Disclaimer of all Warranties and Duties, Limitation of Liability and Remedies, Intellectual Property Rights, Indemnification, Release and Waiver, Applicable Law & Jurisdiction shall continue to remain in full force and effect indefinitely. 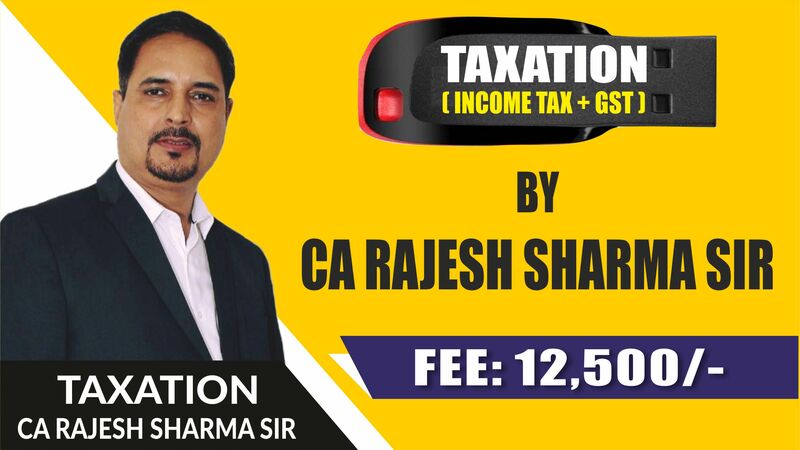 Must go through each point carefully before purchase CA Inter TAXATION Income Tax and GST Pendrive Classes. 2. We are under impression that this class is being purchased by the students for personal use only and we are providing this classes/product for the same purpose. Reproducing lectures or books or any material provided in any format or attempt to breach the security / copy the lecture / share with any party / unauthorized party (authorization will be decided on the basis approval from way to pinnacle institute private limited), copying and delivering lectures etc. will attract strict legal proceedings under Indian laws to its full extent. 3. 100% coverage as per ICAI syllabus and material, fully updated as per new course, high quality, Full HD lectures which will run on Laptop only. 6. Time or views extension won’t be done. 7. Lectures / product will be valid for 6 months from day of activation with 1.5 times views of each lecture. All amendments will be provided free of cost, if any. 8. Classes can’t be displayed using projector or any external display. 9. Package includes Books of Income Tax (Vol. I & II) and GST (One Volume), MCQ + Q & A (One Volume) and lectures of approximately 225 hours (total lectures 89 and a lecture on an average of 2½ hours). 10. Student needs to provide a photo id proof, ICAI registration letter, a self-declaration video (sample is available on website :- https://bit.ly/2BfIHoH), through e-mail or whatsapp to mentioned e-mail id and what’s app number only. (For email id and what’s app number, Photo ids and link to sample self-declaration videos link see here: https://bit.ly/2BfIHoH). 11. Documentation is essential pre-requisite for dispatch of package. No exception will be made in this context. 12. For system requirement click the system requirement tab at the time of enrollment, also go through product description and features or see below for link. 13. To use the product first time student needs to have internet connection for activation, we also get your system details (at hardware level) and students are advised to use this product for personal use only. c. Processor: Core 2 Duo 2.0 GHz and above. Make sure your system is virus free. If in doubt scan with a good anti-virus or format system before proceeding. Ensure All audio, video and system drivers are installed. If in doubt consult your computer dealer. 4) Goto the ‘HowToPlayVideos’ folder. Only Videos in this folder can be played with Windows Media Player/VLC. Rest of the Videos on the pen drive/DVD/HDD CAN ONLY be watched through ContentBrowser software. 5) In ‘HowToPlayVideos’ folder, Watch video Video_1_HowToStartVideoSoftware.mp4 or read document HowToStartVideoSoftware.pdf. 6) After watching video Video_1_HowToStartVideoSoftware.mp4, goto DVD/Pen Drive/HDD folder and double click on ContentBrowser. Follow instructions as seen in video to activate the software. 7) If any errors show up during activation/using software watch the other videos (or read the other documents) in the ‘HowToPlayVideos’ folder. 9) While playing videos IF you get an error message like: “Incorrect version of Codec pack installed or corrupt Codec… “, then please un-install DVD playing software from your computer like Cyberlink DVD Player, Lenevo DVD Player, Power DVD Player, any DVD burning software like Nero, Ashampoo etc. DO NOT copy files from one Pen drive/HDD folder to another pen drive/HDD folder. Even if the file names might be the same THEY ARE NOT THE SAME FILES. DO NOT RENAME FILES on the Pen drive/HDD folder. Doing so will make the videos Unplayable.